Once there was nothing. Then there was something . . .
Come on a fascinating journey through time––from the explosive beginnings of our planet through the formation of the Australian landscape, from the deeply entrenched history of our Indigenous people to modern-day Australia. 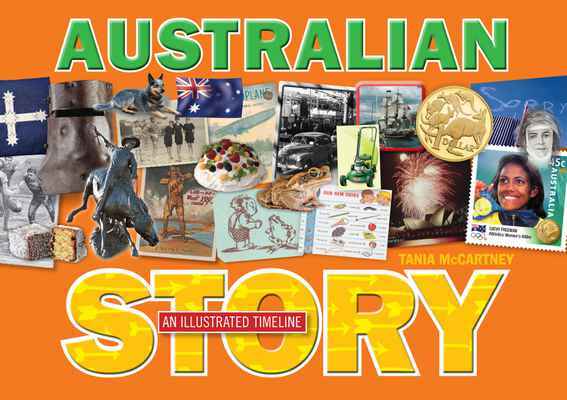 Beginning with the creation of our country’s landmass and climate, Australian Story: An Illustrated Timeline presents the key moments in our country’s geographical, faunal and floral formation, and later human settlement. Featuring succinct entries on historical moments over the past 47 billion years, Australian Story covers such topics as ecological change, social upheaval, politics, invention, the industrial age, war, immigration, celebration, culture and modern technology––and presents them in a way that is visual, fun and thoroughly entertaining for children. Illustrated with a striking collection of photographs and images from the NLA’s collection, this is history for children like never before. A fascinating snapshot of our country, Australian Story tells who we once were, who we are today . . . and where we are going. Originally published in 2012, Australian Story is now brought up to date with events up to 2016 and a new cover.